Missionary Oblate Bishop Paul Duffy of Mongu Diocese in Western Province of Zambia is being threatened by the ruling government over his support for and speaking on behalf of poor people. Bishop Duffy issued a statement in which he said the people of Western Province think it is time for change. His statement has elicited a strong response from the ruling party, with a section of the Movement for Multi-Party Democracy (MMD) threatening to beat him up. 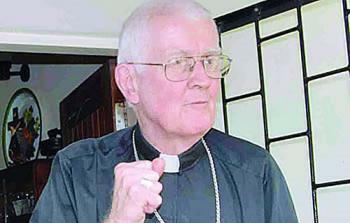 Bishop Duffy has questioned the governments’ motive in borrowing huge sums of money which does not visibly translate to development in the country and in particular the Western Province of Zambia. On September 16, all priests and catholic groups in Mongu diocese released a statement of support of Bishop Duffy OMI in which they added that the people of Western Province are tired of being referred to as the poorest province in Zambia.